Anacamptis morio (L.) Bateman, Pridgeon & M.W. Chase 1997. Cephalanthera damasonium (Mill.) Druce 1906. 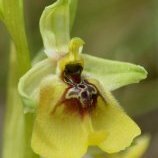 Ophrys sphegodes subsp. sphegodes Miller 1768.